An artist's concept of a lunar electrostatic radiation shield. Researchers are studying whether spherical generators perched atop 40-meter masts could one day ward off harmful radiation from human moon bases. A team of researchers is looking to the moon to develop the tools future astronauts may need to ward off potentially life-threatening levels of space radiation. Currently mid-way through their NASA-funded study, the researchers are working to determine whether a set of electrically charged shield spheres atop 40-meter masts could deflect radiation from a populated moonbase. If it proves possible, such a radiation-proof screen - called an electrostatic shield - could protect astronauts from the long-lasting, and possibly fatal, radiation hazards of spaceflight beyond the Earth's magnetic field. "The electrostatic radiation shield is a pretty simple idea," said the study's co-principal investigator John Lane, an applications scientist with ASRC Aerospace Corp. at Kennedy Space Center (KSC). "We're concerned about charged particle radiation." That radiation, high-energy protons and electrons spewed out by the Sun during massive solar storms or traversing the universe as galactic cosmic rays (GCRs), are the main hazard targeted by Lane, his colleagues. ASRC researcher Charles Buhler is leading the study, which is a Phase 1 project funded by the NASA Institute for Advanced Concepts (NIAC). Despite the apparent ease of past lunar exploration radiation-wise, such as NASA's successful Apollo moon landings, without adequate shielding long-term occupation of the moon and space exploration may remain out of reach, researchers said. "A lot of people think about the Apollo astronauts, and that they didn't have much protection and were fine," Lane told SPACE.com. "But in Apollo, it was a very short mission and a lot of it was basically luck. I'm not sure how they managed to be so lucky, but I don't think you can count on luck on short missions for the future or trips to the planets." Researchers have said that a major radiation event during the any of six Apollo moon landings could have been catastrophic to the astronauts who carried them out. But Apollo crews lived on the moon for days at most, while long-term mission will run much longer. Radiation from galactic cosmic rays or solar particles, however, would be extremely likely to affect a long-duration stay on the moon, researchers said. Currently, Lane and his colleagues are trying to find the best way to arrange large field generators - the spheres - of different sizes to create an electric field that repels high-energy protons and electron. "The first question is, 'what field do you really need to stop these charged particles,'" Lane said. Current designs call for weak, negatively charged spheres distributed along the shield's outer regions to sift out electrons while strong, positively charged generators cluster at the center to deflect high-energy protons, Lane added. 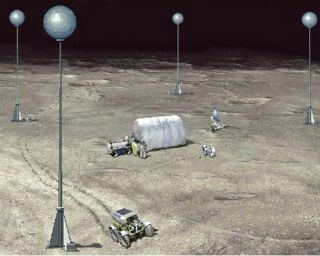 But the challenge lies in arranging a number of spheres to build a comprehensive electric field that is strong enough to deflect radiation, but not so strong that it rips electrons out of the moonbase structure or surrounding material - hence the 40-meter poles to keep generators at a safe, water tank-high distance. "That's one of the design constraints," Lane said. The researchers are currently not addressing the shield design's power needs, though scientists with past studies say they may be staggering. "The real issue is what type of power levels will this type of shield need," said NASA physicist Robert Youngquist, who is studying the potential of an electrostatic shield for future spacecraft. "If it's too much current, that's a potential showstopper." But at least for a lunar base, astronauts would have the benefit if having half of their surface - mainly the floor - already shielded against radiation by the sheer bulk of the moon, Youngquist told SPACE.com. To maximize the effectiveness of a lunar electrostatic field, ASRC researchers envision a tiered approach to radiation protection. Spherical generators could be combined flat electrostatic screens placed low to the ground to keep moon dust from being attracted to generator surfaces and clogging the works, Lane said, adding that the same lunar material could be tapped as a secondary shield. "I think the most likely system will involve regolith or sand bags built up like an igloo," he said. Meanwhile, Youngquist said there are still other researchers looking into developing radiation shields using magnetic fields and plasma, streams of electrons that have been ripped from their source atoms. "Whether or not [the final shield used] is electrostatic, it's still something we need to study closely," Lane said, adding that there are still many other engineering challenges involved with future moon and Mars exploration." If it's not a good method, at least we'll know why."